Gregoire Boonzaier was one of South Africa’s longest-lived and most popular artists, and embodied many apparent contradictions in his work. In 1991 Albert Werth noted that in Boonzaier ‘we see unified … the two poles of conservatism and … experimentation’.1 Gregoire became a powerful figure in the South African art world of the 1930s and 40s, first as Chairman of the New Group in 1938 and then as a founder member of the SA Association of Arts in 1944. Esmé Berman mentions Boonzaier as one of the principal exponents of ‘Cape Impressionism’.2 This was hardly something that he evolved personally, but rather owed to the precedent of Pieter Wenning (1873–1921). Nevertheless, it was a style that Gregoire made his own, gaining himself a popular following and also many imitators. It is perhaps in this light that his work can be more sympathetically considered, for despite critical observations on the limitations and formulaic aspects of his art, he became an admired success-story and role-model for many aspiring artists from underprivileged backgrounds. Albert Werth. 1991. Gregoire Boonzaier. Oliewenhuis Art Museum: Bloemfontein, p. 27. Esmé Berman. 1983. Art & Artists of South Africa. A.A. Balkema: Cape Town and Rotterdam, pp. 84–85. In 1989, R135 000 was paid for the artist’s oil. After the Storm at Die Kunskamer, then in Burg Street, Cape Town. David Lewis. 1946. The Naked Eye. Paul Koston: Cape Town. p. 35. Born Newlands, Cape Town, 1909; died Onrus, Cape, 2005. Training 1935-1936: Heatherley School of Art, London, under Bernard Adams. 1937: Studied Graphic art at Central School of Art, London Selected Exhibitions 1931: William Derry Gallery, Cape Town, first of numerous solo Exhibitions held throughout South Africa over many years. 1936: Royal Academy, London; Empire Exhibition, Johannesburg. 1938: First exhibition of The New Group, Cape Town. 1948: South African Art, Tate Gallery, London. 1952: Van Riebeeck Tercentenary Exhibition, Cape Town. 1966: Republic Festival Exhibition, Pretoria. 1978: Prestige Exhibition, University of Potchefstroom. 1991: Gregoire Boonzaier Retrospective Exhibition, Oliewenhuis Art Museum, Bloemfontein. Collections Museum Afrika, Johannesburg; Iziko SA National Gallery, Cape Town; Durban Art Gallery; Hester Rupert Art Museum, Graaff Reinet; Julius Gordon Africana Centre, Riversdale; Oliewenhuis Art Museum, Bloemfontein; Potchefstroom Museum; Nelson Mandela Metropolitan Art Museum, Port Elizabeth; Ann Bryant Gallery, East London; William Humphreys Art Gallery, Kimberley. Awards 1980: Honorary Doctor of Philosophy, University of the Orange Free State. 1989: Cape Art Medal of the SA Association of Arts. 1989: FAK Prize for Outstanding Cultural Achievement. 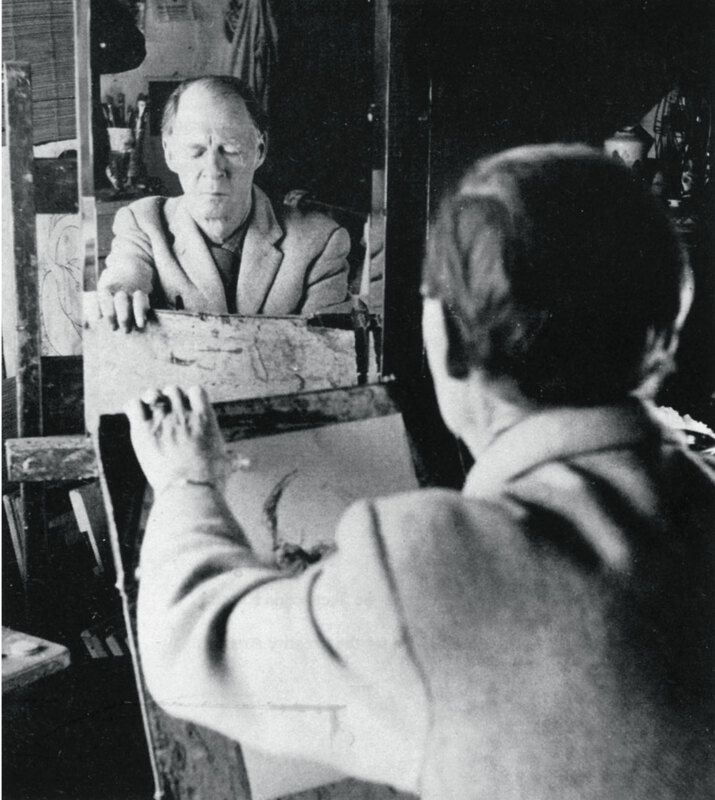 Gregoire Boonzaier at work on a self portrait. Source: Gregoire Boonzaier Oorsigtentoonstelling/ Retrospective Exhibition catalogue, Oliewenhuis Art Museum, Bloemfontein, 1991. Photographer unknown.